My name is Rooney. I was named after The Steelers owner, Art Rooney. My family brought me to Mason, Ohio on Easter Sunday, 2008, from Seattle, Washington. 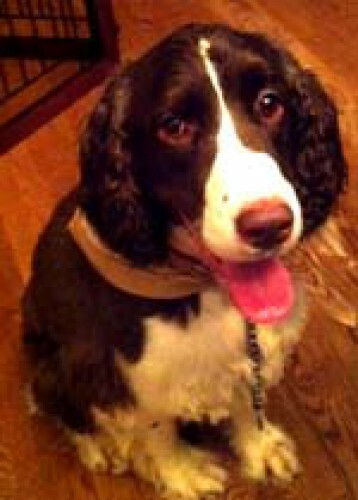 I am the great nephew of their previous Springer, Higgins. It was a long trip to Mason, but little did I know I would be moving again later that summer to China. That's a long trip. I lived there for 3 years. I had no yard, but I had a pool and discovered I had a talent for swimming! Now that I'm back in Mason, I have a yard to run in!! So happy!! I can catch birds. And I bring all my catches for my family to see. I enjoy other activities as well. I'm excellent at counter-surfing. I've scored an entire Easter Ham once!! Several loaves of bread, Halloween Candy, bacon, and entire pizza's, to name a few! I used to enjoy eating shoes, eyeglasses and cell phones, but food is much tastier! Oh, and I'm an excellent bird catcher! !